these are used for roosting. In many species a whole group of birds use such sleeping nests together. 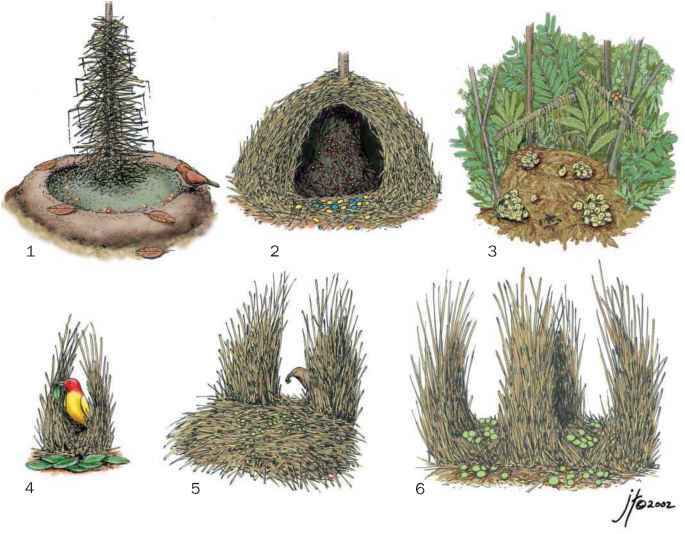 Nests are usually placed in bushes or low trees. Some species nest on the ground, while others suspend their nests between grass stalks or reeds or nest in tree holes. The clutch usually consists of four to six eggs, with rare cases of up to nine. Both sexes incubate eggs and brood young. In the daytime they relieve one another at approximately equal intervals of about one and a half hours, while at night both sexes in many species sit together in the nest. The male, when appearing for relief at the nest, often brings as a "present" a bit of grass or feather. The incubation period is 12-16 days. Young receive mainly half-ripe seeds. Parents regurgitate these in small portions from the crop and push the food into the young bird's gape. The nestling with wide open bill grabs the adult's bill about the angles. The begging posture of the young is also unique among passerines. They do not stretch the head and neck towards the parents, but lay the neck flat on the nest floor, turning only the gape upwards. The chick's bill is wide open, displaying the characteristic pattern inside the mouth and the head is moved from side to side and turned in a lively manner. There are no trembling wing movements so characteristic in other food-begging young birds. This begging posture is retained after leaving the nest. The nestling period lasts about three weeks, which is surprisingly long for such small birds. Even after fledging, the young have not definitely left the nest, for the parents guide them back to it for sleeping and, at first, even for feeding. Young remain dependent on the parents for food for one or two weeks after fledging. 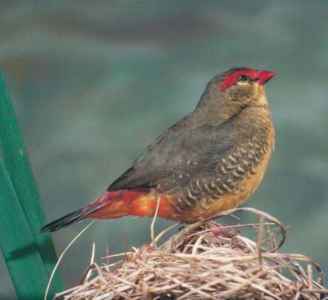 Some species of weaverfinches serve as brood hosts for the whydahs and indigobirds (Vidua spp.). Each parasitic species has a corresponding estrildid host species with which it shares many similarities including juvenal plumage as well as the characteristic species-specific mouth markings. This result of convergent evolution is used to fool the host species into accepting their "adopted" charges. The similarities between the groups have even fooled ornithologists in the past to place them within the same family. The whydahs and indigobirds are now rightly placed in family Ploceidae with the weavers, their true relatives.